MiFID II – Starting next Wednesday, the European rule known as MiFID II is expected to change the way business is done in some parts of the equity market. We won’t rehash all the details here since there have been numerous articles and broker notes already written on this topic. While some research shops are expected to feel the pinch, the effects on other areas of our industry are still unknown. Themis Trading has always been 100% focused on best execution. We use a multitude of trading tools and are constantly customizing and updating these tools to help our clients maximize liquidity while minimizing market impact. While MiFID II may be new, best execution is not. Access Fee Pilot – Eighteen months after it was recommended by the EMSAC, we still have not seen an Access Fee Pilot proposal from the SEC. We thought this would be an easy one for the SEC to push through this year since there seems to be consensus in the industry that something needs to be done about access fees. Unfortunately, since the EMSAC recommended the access fee proposal, a lot has changed at the SEC. A new Chairman has been selected and two new Commissioners were finally just approved by the Senate last week. The SEC also came under fire from Congress recently for a cyber security breach that affected its EDGAR filing system. While these are certainly big issues, we believe that they are no excuse for the SEC dragging their feet on an access fee pilot proposal. Consolidated Audit Trail – The industry has been hell bent on slowing down the CAT. The Equifax cyber security issue that occurred earlier this year gave them a perfect excuse to plead their case that the CAT needed to be revisited since it contained personal information which could be hacked. Fortunately, after seven years in the making, the SEC was tired of the delays and rejected the industry efforts to stall the CAT. Beginning on November 15th, the exchanges were required to begin sending data into the CAT. Absolute Immunity – The largest stock exchanges suffered a major defeat on December 19th in their ongoing class action lawsuit war when the US Court of Appeals ruled that “exchanges are not entitled to absolute immunity, and the district court erred in dismissing the complaint”. The ruling in the City of Providence, et al. v. BATS Global Markets, Inc., et al. case opens the door for numerous class action lawsuits filed by investors against the exchanges to proceed and could result in millions of dollars in damages against the stock exchanges. Stock exchanges will now have to answer for all of the things that they have done to corrupt the equity market over the past decade. 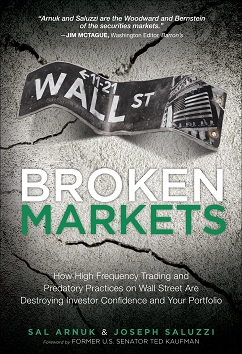 While HFT may have been the ones doing the damage for all these years, it was the stock exchanges that armed them with the weapons to take advantage of traditional investors. Information Leakage – Nasdaq withdrew a few market data products, known as Pathfinders and Velocity, after it was revealed that these products leaked confidential information about client orders. These products, which have been around for 12 years, were taking all customer data – buys/sells/cancels – and packaging them into sentiment products that can be used to short term trade. Ever since our 2010 white paper titled “Data Theft on Wall Street”, we have been warning that exchanges have continued to leak information through their data feeds and other data related products. This latest move by Nasdaq proved our point. BATS Market Close proposal – BATS has proposed the “BATS Market Close” which is an alternative to the closing auction offered by Nasdaq and NYSE. The proposal allows BATS members to submit buy and sell market-on-close orders and obtain the official closing price for matched shares. The proposal generated an enormous amount of debate in the industry and is still pending approval from the SEC. However, the proposal has already created change in the industry since NYSE announced last week that they will be lowering the fees for their closing auction. While cryptocurrencies have been around for a few years, it wasn’t until this year that Wall Street really started to pay attention. The crypto world really heated up after the CME announced in October that they would be offering a bitcoin futures product. In early December, the Cboe was first to trade bitcoin futures and the CME followed a week later. We were surprised that the CFTC allowed these exchanges to self-certify bitcoin futures since the underlying exchanges where bitcoin is traded are known to have numerous problems including manipulation and hacking. While we are not cryptocurrency experts, we entered the bitcoin debate because we saw a market structure problem with the underlying exchanges. Until these exchanges are regulated, we don’t believe that derivatives on cryptocurrencies should be allowed to trade including the proposed bitcoin ETF. “The Commission is disapproving this proposed rule change because it does not find the proposal to be consistent with Section 6(b)(5) of the Exchange Act, which requires, among other things, that the rules of a national securities exchange be designed to prevent fraudulent and manipulative acts and practices and to protect investors and the public interest. The Commission believes that, in order to meet this standard, an exchange that lists and trades shares of commodity-trust exchange-traded products (“ETPs”) must, in addition to other applicable requirements, satisfy two requirements that are dispositive in this matter. First, the exchange must have surveillance-sharing agreements with significant markets for trading the underlying commodity or derivatives on that commodity. And second, those markets must be regulated. In our opinion, approval at this stage would be a mistake with potentially catastrophic consequences since a bitcoin ETF might find its way into portfolios that do not have a risk tolerance for such a volatile security. We hope the SEC remains firm in their demands for cross-market surveillance of the underlying exchanges before even considering an ETF. “In summary, we have a market built around the race for speed that has created public markets that are too thin and fragile – especially in times of stress. Payment for order flow is an incomprehensible and permissible tax on investors – a conflict of interest that needn’t exist. Dark pools have been perverted from their intended purpose of facilitating large block trades, and data feeds have been created and enriched with information that serves to facilitate investor order leakage – yet another tax on investors. According to JPMorgan, only 10% of today’s stock market volume is from “fundamental discretionary traders”. If most of the stock market volume is coming from machines that try to anticipate when prices will move and then trade ahead of that price move, are stock prices accurate? This is concerning to us, and we hope it is concerning to you. We’re hoping that Congress continues to look into some of the issues that we raised and would welcome another invitation to testify. At the beginning of the year, we made it one of our goals to write more comment letters on stock exchange proposals that we considered controversial. We know for a fact that the SEC reads these letters and sometimes gains new insights into an issue from a commenter. This year started with some good news about a controversial order type that was proposed by Nasdaq at the end of 2016. We objected to Nasdaq’s proposed Retail Post-Only order type and wrote a comment letter to the SEC explaining how we thought the order type would violate a broker’s best execution responsibility. Even though our letter was the only one written, Nasdaq decided to withdraw the proposal in January. This withdrawal once again proved to us that comment letters do work. Exchanges and market makers are very good at advocating for themselves and rely on the fact that there is often only minimal opposition to their proposals. We believe that it is extremely important for regulators and policy makers to hear the other side of the argument and we will continue writing comment letters in 2018. We expect 2018 to be another busy market structure year and anticipate that there will be numerous proposals from the exchanges and even some finally from the SEC. We will stay vigilant in our response and will continue to keep you updated on the important issues. Tomorrow we’ll be issuing our annual market structure predictions for the New Year. Stay tuned, we think you will enjoy them.